Roots Garden Center offers all the flowers, plants, shrubs and trees you need to create a beautiful, and colorful outdoor oasis. Homeowners and landscapers alike will enjoy exploring our unique and varied selection with the assistance of our attentive team who is always available to answer questions and offer guidance when needed. 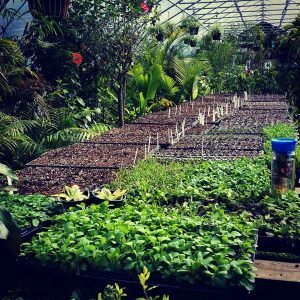 Our garden center features a vast perennial selection, annual plant section, a tree and shrub nursery area, tropical plant greenhouse, herb, fruit and vegetable house, garden pottery shop, produce stand, and landscape and bulk supply section. We also have nine display gardens that showcase plants in their natural landscape, offering visitors with inspiration for their own landscapes. Our inventory and displays change seasonally and we are open year-round. During the summer, we pick and sell produce and cut flowers from our own garden and local farms. Everything is fresh, local and in season! From lettuce to tomatoes, sunflowers to local honey, our summer bounty is found at Roots. We cater to the experienced gardener as well as beginners and invite you to bring in your own inspiration photos for a complimentary design for small projects. Roots can then deliver everything you need for your landscaping project, or even install the garden of your dreams for you. We also offer potting services and will repot tired houseplants or assemble custom container gardens, on site or at Roots, for you. Whatever you need, where ever you need us, we are here to help! Perennials & Annuals – We offer a unique and vast selection that you can’t find anywhere else. Every specimen includes a description tag with plant care, lighting and water requirements, and usage suggestions. Ornamental & Shade Trees – We’ve given a lot of thought to the inventory we carry to best suit our beach environment, including unusual species that you don’t see everywhere. We focus on plants with favorable characteristics such as low tree and branch litter, pest resistance, and less invasive root systems. Our inventory also includes mature tree specimens that make an immediate impact. Shrubs – We have a large collection including evergreens, deciduous, natives, flowering, and dwarf varieties. Roses – You’ll find the owner friendly Knockout, Drift, and Rugosa,or beach roses. These disease resistant, ever-flowering, and low maintenance varieties are a carefree solution to a problematic plant. Ornamental Grasses –All types are available. We stock species from the prairie to the shore, both large and small. Unusual Specimens – Looking for something different? check out our unusual specimens. We carry contorted and twisted varieties, sub-tropical species, unusual conifers, and sculpted topiaries. Vegetables & Herbs – A great selection of cold and warm weather vegetables. We carry varieties that have been tested and grown by us. We choose garden plants that are work horses in the garden showing signs of disease resistance, drought tolerance and high yields. We also carry a large selection of popular and hard to find herbs to flavor all those fantastic veggie dishes. Fruit Trees & Shrubs – Looking to start your own little orchard? Look no further! We have stocked tested and hardy varieties of fruit trees and shrubs. Not only do we have apple, pear, apricot, plum and persimmon trees (to name a few), but we also carry tropical citrus trees! We also have many types of fruit bearing shrubs as well. Tropical Plants, Houseplants & Succulents – Need some tropical foliage and flowering plants to jazz up your patio and pool areas? How about trendy houseplants like fiddle leaf Ficus, split leaf Philodendron, cactus, and succulents? Visit our fully stocked tropical house. Aquatic Plants – A selection of hardy and tropical pond plants to decorate your outdoor pond and other water features. Holiday Nursery Items – Christmas trees of all sizes, handmade wreaths, fresh greenery, garland, cemetery arrangements, table arrangements and holiday plants. All you need to deck your halls this Christmas can be found here at Roots!